Simple Homes came about by the sheer number of requests. 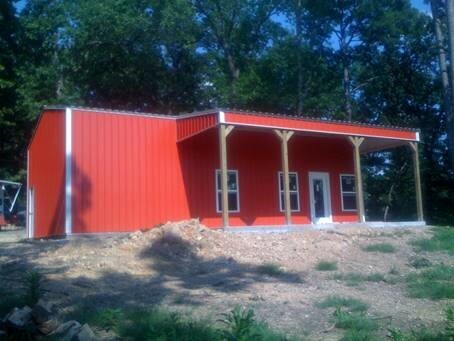 Simple homes are metal buildings designed to look more like a conventional home. 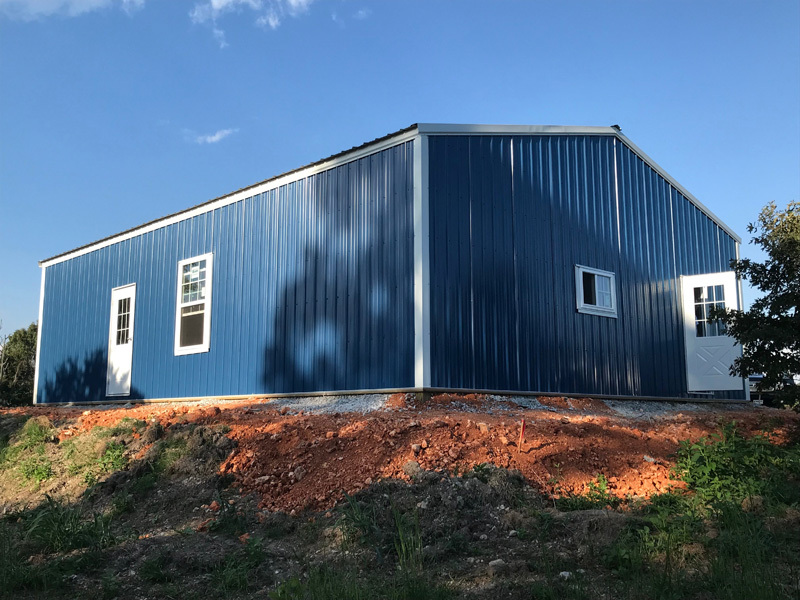 The economy is the metal roof and wall panels. We dress them up with overhangs, wainscot and a porch. We include the 3050 windows needed for the bedrooms, the 2020 window, and the gable vent for the bathroom. These simple homes come with a nice French Door opening up to the porch. Just to clarify: We are not a custom home builder. Our Simple Homes are just for the shell. No interior work is included. However, you get a lot for your money! Simple Homes can be built on a floating slab with a thickened edge or a foundation, depending on what county they will be built in. Our simple homes include two walk doors - One standard and the French Door. They also include a set number of windows. The roof trusses are set 24" on center, per building code. 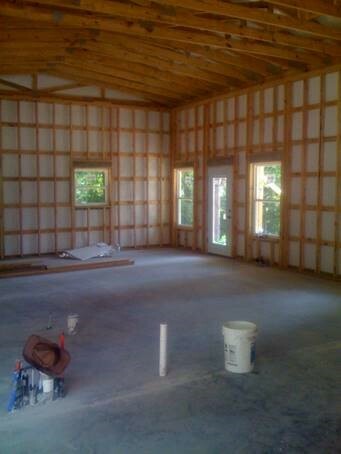 By using perimeter load bearing walls, the interior is a blank sheet of paper. The number of bedrooms and layout is up to the customer. 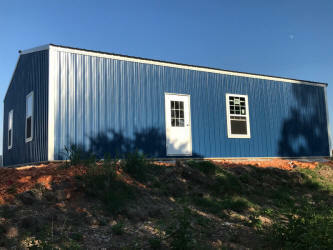 The walk doors and windows placement is up to the customer. The "shell" gets the customer in the dry. Though not complete, the home is now weather tight and can be locked up. Once in the dry, you have a chance to catch your breath and slow down. The demanding-sequence-critical construction timeline is over. The customer can now take over without deadlines. 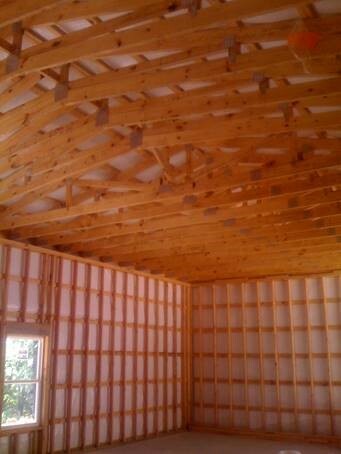 By the Simple Home shell being one big open room, the customer has the opportunity to put their stamp on it. 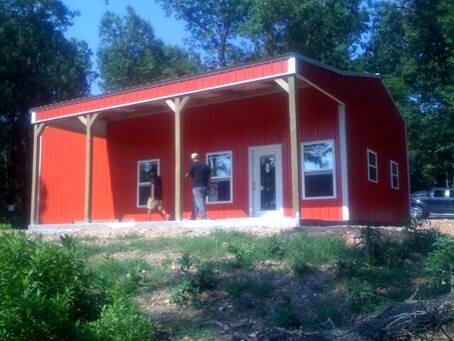 We have had great success building the Simple Home shell and then for the customer to say "I got it from here". OMB uses a thicker 26 ga trim for the Eave on our Post Frame, Stick Frame and Simple Home buildings. 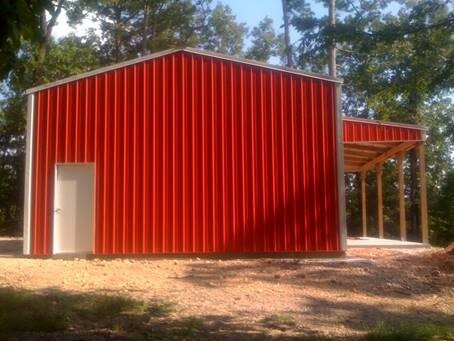 This is a feature that no other Arkansas wood metal building company includes (to the best of our knowledge). How straight the trim is at the top often dictates how well the overall building looks. The standard 29 ga trim that other companies use looks wavy on most buildings. Deflection is the term an Architect would use. Cheap looking is how most customers would describe it. Having decades of experience still doesn't help when dealing with a flat piece of 29 ga trim that is 20' long. It is next to impossible to get rid of all the deflection. Even by spending the time working it, until it is perfect today, it will deflect over time. Our solution is simple: by using the thicker and stiffer 26 ga for the Eave trim, it does not deflect near as much. The fasteners do not dimple the trim, plus you can make the connection tighter. The cost difference between the two types is negligible; however, the difference in appearance is night and day. Our trim simply looks better longer. 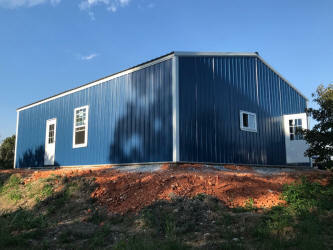 This is when $35.00 makes a huge difference on a $20,000.00 dollar building. These are the small details that add up to a great building.